If you are searching for an affordable everyday backpack that can be equipped with an external solar panel as well as providing plenty of pockets for all your gadgets and everyday needs. You may be interested in the Kody which has been designed by Bob Gruder and team. 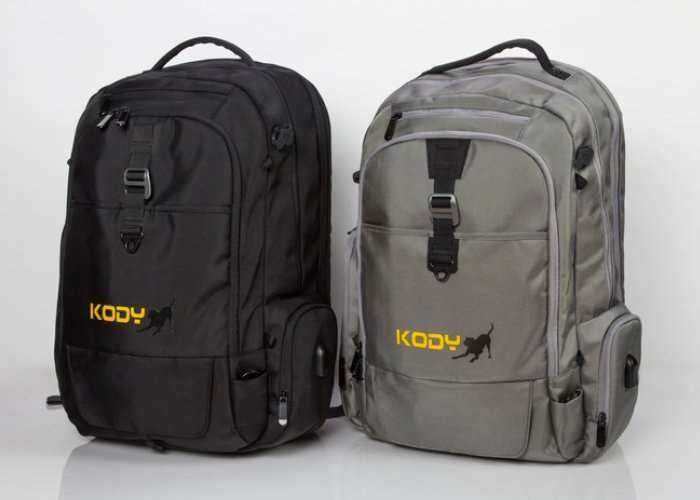 Check out the demonstration video below to learn more about the Kody everyday backpack which has been designed for people on the go and provides space for everything you need and more, says it’s creators. No backpack offers all of these features: USB port, power bank, RFID lined pocket, insulated pocket, Bluetooth speaker, neoprene laptop carry case, padded laptop sleeve, holds up to an 18 inch laptop!, flashlight, spork, TSA folding compliant, waterproof cover, hidden pocket, spring rings to hold bottle clamps or keys, sunglass compartment, approximately 40L size, sliding sternum strap, YKK coated zippers, double padded back and sleeves. The Kody Backpack provides a giant insulated pocket for to keep your beverages and food hot or cold. When I hike or go to business meetings, I usually pack a cold drink. The trouble is, with traditional backpacks, the drink gets warm too quickly, I couldn’t even imagine packing a sandwich in a standard backpack! 16 ounce drinks or standard 10 inch hiking bottles fit great in our insulated pocket. Kody is now available to back via Kickstarter with early bird pledges starting from $129 and delivery expected to take place during December 2017. For full specifications and more information jump over to the official Kickstarter campaign page via the link below.